I ran across this splendid, betentacled dining-room set the other day, and originally assumed that it was from some offbeat furniture gallery. After a bit of digging around, I discovered that it’s actually the work of artist Christen Shaw; there are a couple of other views in her Flickr stream. In that same stream is some other splendid furniture detailing, including a wonderful ouija board coffee table and an adorable baby ghost rocking chair. Shaw’s designs are all hand-painted, but for those of us whose painting skills fall somewhere between “primitive” and “kindergarten,” something similar might be achieved using stencils. In particular, the monochromatic ouija board and the clean lines of the tentacles should lend themselves well to this process. You can create the design you want in a computer graphics program, then print it out (a copy shop such as Kinko’s can print large designs that a home printer can’t handle) and turn it into a stencil. If you’ve never stenciled furniture before, there are loads of tutorials to get you started: This one from TLC provides a good overview of the whole process, and Royal Design Studio has some addtional useful tips. Stenciling or painting is a great way to add character to bland, inexpensive furniture, and it can also breathe life into old pieces that you’re tired of looking at. Delicate spiderwebs, folk-art skulls, and other spooky accents are easy to do and are a lovely way to bring your own personal style to a room. p.s. – Shaw also designs tattoos, so if you’re looking for something really unique you might check what she charges for commissions. I’ve run into paperback-cover wallets elsewhere, but they’re always just the length of the cover and thus don’t have a lot of capacity. I came up with a different method which extends the wallet into a trifold with lots of storage space, plus it shows off more of the cover even when folded. 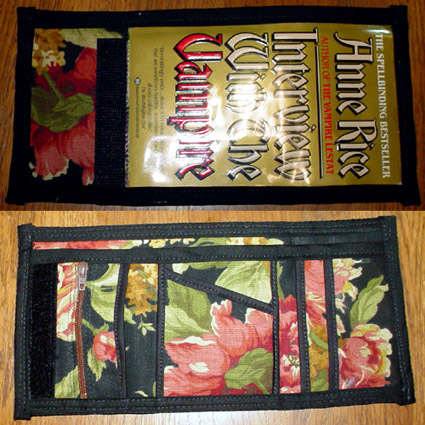 Now you can turn your favorite spooky paperback cover into a functional wallet. The Adorable Knight Rises – Collection of baby bat photos and videos at Buzzfeed. You will squee yourself silly. Nightmare Before Christmas Yard Decor – Some fantastic homemade Christmas/Halloween decorations, including some build notes. I particularly love the “Zero” doghouse. Va-Va-Voom Vintage – Collectors Weekly interviewed Dita von Teese on some of the more interesting items she collects. Neil Gaiman Writing a Sandman Prequel – It’ll be available in 2013. Neat. Rockabilly Hair Decoration – Tutorial for making a Rockabilly-esque fascinator. “Witch House” Models – A pair of surreal sculptures by Annie Owens. These would be the coolest birdhouses ever. Creative Body Art – Some eerily-realistic face painting, plus a few other odds and ends. Rat Head Catnip Toy – Knitted “decapitated rat” cat toy. There’s also a severed finger version. Cast of Munsters Remake Looks Like Normal People – Apparently they’re only monstrous on the inside. Man, this reboot is just going to be one long headdesk. I’ve been lukewarm about this “prequel,” but I gotta say the trailer looks pretty slick. Over at the Halloween Drinks blog, Scott believes he’s perfected the art of homemade pumpkin liqueur. I might question his use of canned pumpkin pie mix instead of plain canned pumpkin because the latter would give you more control over the spices, but it looks like he’s put a whoooole lot of experimentation into the project. There are plenty of other variations out there, including ones that use pumpkin juice* and roasted pumpkin, so there’s plenty of room for additional experimentation. Once you find a variation you like, google “pumpkin cocktail” to find plenty of drinks which feature the liqueur. I really like Scott’s bottling idea, with custom-printed labels and novelty stoppers, but there are a zillion other packaging options. One nice presentation would be a recycled wine bottle decorated with a pumpkin bottle collar. You could also paint or etch a bottle with a motif of your choice, or glue ribbons on the outside. *Life is too short to juice a pumpkin. Hey look! It’s another place to spend entirely too much money! I need to stop finding these. Fivehands Curiosity Shoppe specializes in “strange medical devices, Victorian oddities, macabre and dark antique items, scarce erotica, bones, cemetery, occult and more. Strong focus on a dark design element is key.” If Morticia Addams decided to open an antique store, it’d probably look a lot like this. They don’t appear to have a brick-and-mortar location, so sales are handled through their Etsy shop. Some of their pieces like this Victorian humidor are (for obvious reasons) fairly spendy, but they have other items like this vintage cast-iron candle holder that are wonderfully appealing and shouldn’t blow your budget. In addition to the shop they’ve also got a Tumblr site, blog, and Facebook page where they discuss some of their acquisitions in more detail. There’s also a main .com site which is rather sparse, although it does include a small gallery of interesting items (I particularly lust after the Victorian dissection kit). If you’re looking to build a collection of unusual vintage items, this is a great place to browse. I ran across the Mosser* terrarium in an otherwise-unremarkable collection of decorations for an office cubicle and quite like the spare, simple design. Fortunately, it’s also easy (and cheaper!) to make your own. To make a moss terrarium in its simplest form all you’ll need is a container, a hunk of moss, and something to park the moss on: It doesn’t really need dirt, but it needs something to hang on to. The container can be just about anything: A glass jam jar, a lidded cake stand, an erlenmeyer flask, or a fish bowl. You can also get much fancier (and commensurately more expensive). You can purchase moss online at places like Moss Acres, but you can also collect it in your back yard or in an abandoned field. (Some tutorials suggest collecting it from public parks or similar areas; I don’t know about other countries, but US laws tend to be pretty strict about collecting any kind of natural material from public lands.) Wherever you get it, make sure to harvest only a small amount from any particular patch so that you don’t destroy the rest of it. And, of course, you can get much fancier. Search for “moss terrarium tutorial” to find lots of suggestions such as the ones here, here, here, and here. Care is easy: Keep it out of direct light and mist it with water occasionally. Moss is a particularly good choice of plant if you have a brown thumb, because it’s quite hardy and requires very little care. The association with spooky, overgrown places is just a lovely bonus. *That link goes to a placeholder page; as of this writing, the Etsy store where they actually sell the product is down. The referring article listed the price as $26 US. **Side note: An easy way to get rustic-looking mossy flowerpots is to toss a hunk of healthy moss into a blender with some yogurt or buttermilk and then paint the resulting slurry on the outside of terra-cotta pots. Mist occasionally until the moss takes hold. Ouija Board Lunchbox – No source, but something similar might be DIY-able with decoupage. Tea for the Morbid – Pinterest pinboard which is relevant to our interests. Mega Lego Skeleton – Instructions for making a giant cardboard version of the little Lego guy. Romulan Ale Recipe – Instructions for a high-octane “official” version of the blue beverage from Star Trek. Mentioned here because the page also lists a drink called a “Cloaking Device,” made with absinthe. P.G. Wodehouse – A rather wonderful random quote generator. Day of the Dead Corkscrew – Neat calavera-themed metal corkscrew. DIYFluffies – Etsy shop specializing in plush patterns and kits, including adorable dragons and monsters. The Things – Short story which revisits The Thing from the monster’s viewpoint. I Has a Sweet Potato – This link is 100% goth-free, but it’s just one of those things that cracks me up. Metal folk-art nichos are a common part of Dia de Los Muertos shrines for the dead, and usually display either religious icons or photographs of the deceased person being honored. Crafting for Cheapskates has a dynamite tutorial for making “tin” nichos out of disposable aluminum baking pans. The instructions are super-easy, with lots of suggestions for optional embellishment, plus work-arounds for those of a less-artistic bent. Nichos are often on the colorful-shading-into-garish side, so in addition to the paint/nail polish the tutorial suggests you could also glue on sequins, fake jewels, or bits of metallic fabric trim. Set them up in a shrine, hang them on your wall, or mass them on an end table. You could even make small ones and use them as holiday ornaments. I would like to propose legislation which will require that certain websites post a prominent Time Sink Alert banner: If you’re likely to hit the site and get lost for two hours, it should warn you in advance. The Museum of Ridiculously Interesting Things would bear such a banner, along with a sub-head indicating particular risk to those of us with darker leanings. The first page alone includes tiny coffins found in a Scottish cave, vintage advertisements for leeches, and a dozen photos of a shirtless Picasso. The Museum of Ridiculously Interesting Things is not a physical place, but an online collection and discussion of the art, objects, ideas and history that contemporary curators, artists and critics find deeply, genuinely, thoroughly, RIDICULOUSLY interesting. It is a slightly tongue-in-cheek anthology of the marvellous, bizarre, exciting, intriguing and inspiring things of the world, paired with conversation around contemporary art and its institutions. You can find jars of pickled moles and toast embroidered with a fried egg. There are taxidermied seagulls with guts made of pearls, vintage mug shots from New Zealand, and straitjackets embroidered by asylum inmates. Thank goodness the site is fairly new or I’d still be stuck there. It probably goes without saying, but the blogroll on their sidebar is full of additional neat stuff. If you’re looking for a collection of ridiculously interesting things, this is definitely the place to go.